The people want more and better ways to get around town, but in 2010 they soundly rejected a plan to make that happen with light rail, bus and road improvements. Still smarting from that loss, leaders are slowly coming back to the drawing board, pushed by business interests that see transportation improvements in Tampa Bay as the key to economic growth. And pushed, too, by recent surveys showing it may be time to try again. 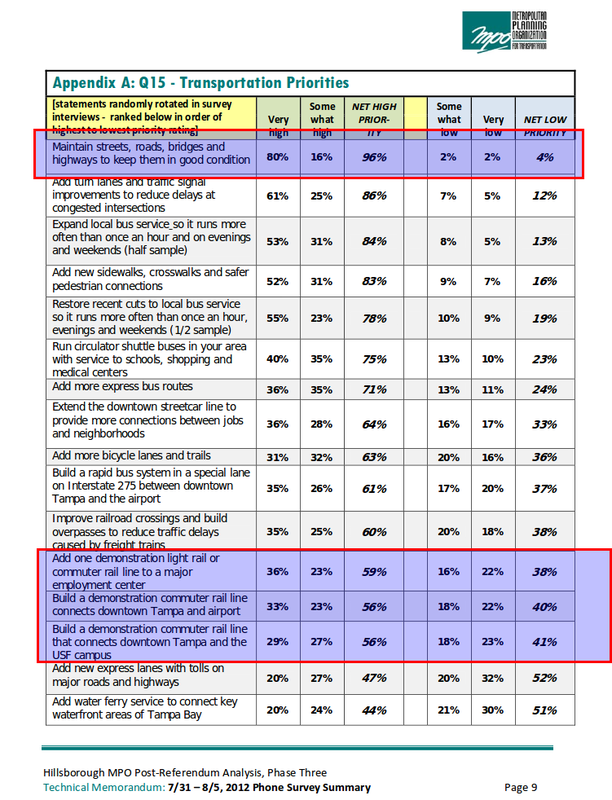 For nearly three of four voters, traffic and transportation are top concerns, according to surveys the Hillsborough County Metropolitan Planning Organization conducted in three phases during the past year. Two in three voters ranked as "somewhat to very high" the need for road and bridge improvements to improve traffic flow, bus service expansion and the beginnings of a passenger rail line. 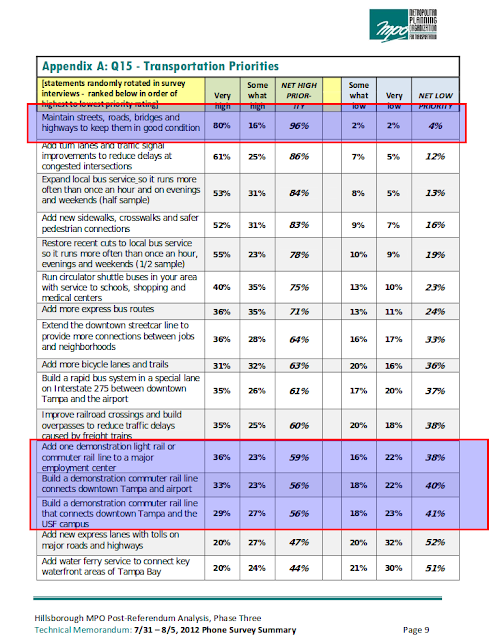 Actually, those recent surveys from the MPO show that 96% of Hillsborough County wants improvements in roads, a much higher than want rail. See below, from the MPO. Why does Jackovics not state what's really in the survey? Well if you read through the survey narrative, it spins and spins on the rail issue, yet light-rail is the 12th rated issue on the survey! Priorities anyone? Why did they need to confuse the topic of “traffic and transportation” with rail? Lets tell the truth here. This is all about light-rail and taxpayer subsidized transportation orienteddevelopment (TOD), not about improving your personal mobility. "Everyone wants transportation improvements, but there is no money for it," said Kevin Thurman, executive director of Connect Tampa Bay, which aims to link grass-roots efforts with business and elected officials. "We have to have serious conversations about what improvements the public wants and how to pay for them." Who is Kevin Thurman? What makes him the go to guy for rail and transportation? He just moved into the Tampa Bay area last year after being a Democratic operative/consultant. His current job according to Linkedin is Executive Director of Connect Tampa Bay. Is he getting paid? Why would anyone pay him to be an expert on transportation issues in a community he just moved to? "We want to find something all of our citizens are comfortable with, what our objectives are, what we hope to accomplish," said County Commissioner Mark Sharpe, who has made transportation improvements a priority. "From my perspective, we are engaged in an economic battle, and delay is not good." Sharpe has been a Hillsborough County Commissioner for what, 10 years? What has he been doing over those years? Apparently not focusing on economic growth. Why are we conflating transportation with economic growth? And here he goes again, wasting his and our time and our money on light-rail as a stimulus for growth, which was soundly defeated in 2010. He apparently does not listen and has not learned anything. Sharpe is an active member of the Hillsborough Area Regional Transit Authority, Metropolitan Planning Organization and served three years on Hillsborough County’s Transportation Task Force. He was selected chairman of the Metropolitan Planning Organization for 2013 and will serve as its representative to the West Central Florida Metropolitan Planning Organizations Chairs Coordinating Committee. In that capacity, Sharpe also will serve on the Tampa Bay Area Regional Transportation Authority board of directors. Sharpe has succeeded in implanting himself in all the transportation related government agencies (why are there so many?) in the region to further drive his agenda around light-rail and transportation oriented development (TOD) as the answer to all known and unknown problems. He is also on the board of Tampa Bay Partnership, the big money behind the lost rail efforts of 2010. Don't ask Sharpe why TOD will work where the Economic Development Council, Economic Prosperity Commissions, Chambers of Commerce, etc., have apparently failed. What's in these plans for small local businesses? How will they prosper? Or will they just pay for it? Some other metropolitan areas found you have to try again and again. The Phoenix area, for example, saw two transportation referendums fail before voters finally found tax packages they liked. The city's light-rail system is now credited with creating business development downtown, providing transportation from outlying areas to professional sports arenas and reinvigorating a blighted north-south artery. Denver, Seattle and St. Louis had similar experiences. They won a war of attrition, during a stronger national economy. The business developments are almost all universally around various tax incentives to encourage development, not from the light-rail itself. More money out of your paycheck. Less money for roads. "A lot of people are scared to try to get things ready for 2014," said Thurman, with Connect Tampa. "But if we don't reach it, be honest with public — there is no magical solution." We agree. There is no magic with light-rail. Next is a session planned for March 20 involving a host of players: County Administrator Mike Merrill, the Tampa, Plant City and Temple Terrace governments, Hillsborough Area Regional Transit Authority and the Hillsborough Metropolitan Planning Organization. We'll be there. Will you? Time to get engaged. We have to stay persistent, and live in the real world. They have big money special interests and are waging a war of attrition. We at The Eye have started with some real world solutions that don't abuse the taxpayers. Take a look here.